In addition to cooking and baking, I enjoy paper crafting and have therfore decided that I should start sharing some of my projects here as well. One of my favorite non-food web-Sites to stalk is Paper Source. I have an obsession with stationery and paper. Most of the crafting I partake in are paper crafts, such as homemade cards, invitations, etc. One day while poking around on Paper Source I saw this ADORABLE wreath kit and thought it would be a fun project to work on one weekend. maximum of $5.00 in supplies from Michaels - gotta love 40% off coupons! With the right tools it's easy to make your own paper wreath. I should point out that I used tools from my mom, aunts and grandma's "scrapping room" since I don't have the room to store anything like this, however if you have all of the tools this can be super cheap too! Cut out shapes on your decorative paper, using the instructions for your machine or punch. You may need to cut up strips or cubes of paper to fit through your machine. To add depth to your wreath make sure to cut out various sizes in all desings/colors of paper so that you can mix and match combinations. Once all of your flowers in various sizes are cut out combine large flowers with a contrasting or coordinating smaller flower. Center smaller flower on top of larger flower and hold together with a coordinating or contrasting brad, inserted through the center of both flowers. Continue with remaining flowers and be creative! You don't have to double up on all of the flowers, you can triple up, etc. 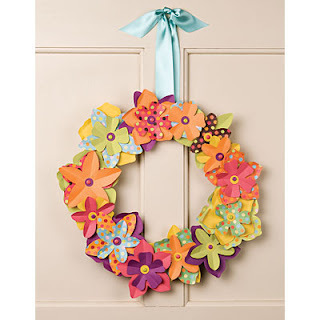 Using your Chip Board, cut out a wreath frame to attach the flowers to. The frame should be about 1 1/2 - 2"s thick and the diameter depends on how big you want your wreath. You could also use a wreath form from a arts & crafts store. Cut a slit big enough for your satin ribbon to pull through, and insert the ribbon, pulling so that both sides of the slit have roughly the same amount of ribbon. Tie a knot or bow on the top, where the wreath will hang from a nail/hanger in your door. 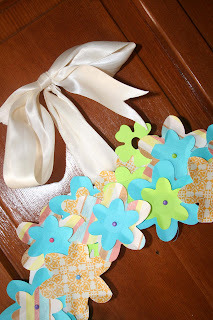 Start attaching the flowers to the frame with the hot glue gun. Be careful - it's not called a HOT glue gun for nothing! Continue attaching the flowers around the frame, making sure to cover the whole thing. Use remaining flowers to fill in gaps, add depth, etc. 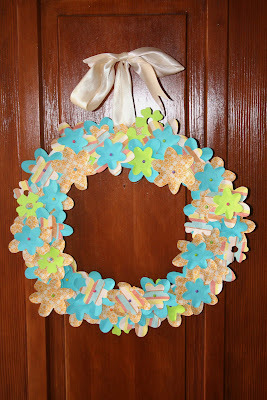 Hang on your door and enjoy your new spring wreath! Cute wreath!!! We will definitely have to go there when you visit.